I remember the first time I ate singapore noodles. I was in university and out for lunch with my then-boyfriend. Most of my Chinese food experience by that point was by way of mall food courts as a teenager. My parents never went to restaurants (well, other than the occasional visit to Pizza Hut). So trying the spicy, curry flavour of those singapore noodles with little bits of shrimp and bbq pork for the first time was pretty eye-opening. I loved that dish and it became pretty much my Chinese ordering staple dish for years. What’s not to love about a dish that has noodles stained bright yellow from curry powder and is filled with spicy bits of pork, shrimp and just enough vegetables to think what you’re eating is sort of healthy-ish. I never thought I could replicate this dish at home, but here I am with the recipe to prove it. 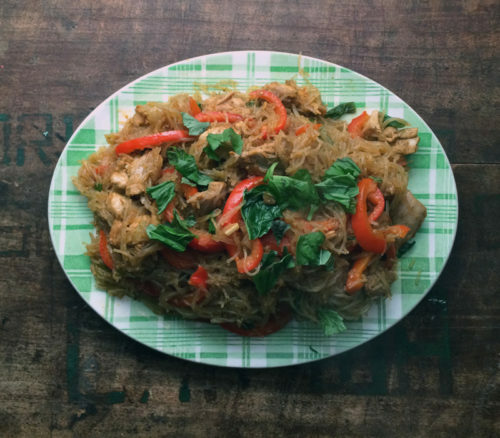 This recipe keeps it simple with using just chicken, red peppers and basil. I added in some scallions because to me, scallions are a must in any good singapore-style noodle. I also added in sriracha to do a quick marinade for my chicken because I like things extra spicy. Instead of using a sunny yellow curry powder, I just used what I had…my good old bottle of Patak’s curry paste – a red curry, not a yellow one. No matter, it was still super tasty. In fact, Cornelius couldn’t believe that I had made it. He thought it was take-out. Silly boy. He gobbled it up and went back for seconds. Think you don’t have time to cook? Think again. The recipe is from the new Mark Bittman book How to Cook Everything Fast: A Better Way to Cook Great Food and just like the other books from his series, this one is a weighty & wonderful tome. In the corner of each recipe there’s a speed icon and to make this recipe takes just 30 minutes. Faster than delivery and now you know exactly what you’re getting! One of the great things about this book is that Bittman snubs the idea of having a mis en place in place before you start cooking. Instead, it’s about working smarter in the kitchen. While you wait for the water to boil, that’s when you chop your peppers and mince your garlic and ginger. When you’re cooking the chicken, drain the noodles and strip the basil leaves from their stems. The fast comes from using those little downtimes in the making of to prep the next set of ingredients. It’s smart and it might be how you already cook in the kitchen anyway. You’ll note that in the recipe I’ve italicized some sentences which tells you that’s when you prep! I’m a fan. I’ve already bookmarked a lot of the recipes, but please note that although there are plenty of vegetable and tofu recipes, it’s decidedly meat/poultry/fish heavy, though you could always make easy substitutions. Also, the dessert section didn’t really appeal…but then again, I don’t turn to Mark Bittman for desserts. Just saying. Leave a comment on this post and tell me about your favourite fast recipe or a quick tip or technique that you use in your kitchen. Comments will close at 11:59 pm pacific coast time on Sunday, December 21, 2014. The winner will be chosen at random and contacted – so make sure you leave a way for me to contact you. Giveaway is open to Canadian residents only (sorry!). One comment per person, please. Entries must be left on this blog post, I cannot accept entries via email. Disclosure: Tomas Allen & Son gave me a review copy of the cookbook and is providing the giveaway copy. I liked the book so much that I asked them to provide a copy to a reader. 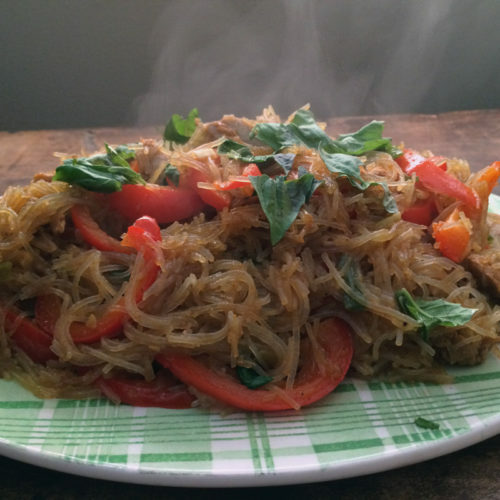 Good luck and maybe forget about take-out tonight…make your own singapore noodles tonight instead. While any curry paste or powder will work here, I think the most authentic version would your standard yellow curry powder. That will provide you with the brightest, sunniest colour and traditional taste. That said, I used my usual red Indian curry paste and it was still absolutely delicious. Want to make this vegetarian/vegan? Use tofu instead of chicken and add extra soy sauce in place of the fish sauce. Bring a medium-sized saucepan of water to a boil and salt it. Cut chicken into 1/2 inch chunks. Drizzle sriracha over chicken bits and use hands to cover every piece. Peel the garlic and ginger; mince them together. Core, seed, and slice the bell peppers. Peel off outer skin & remove any brown parts of the scallions, cut into 1 inch pieces. Thicker parts of the scallions can be sliced diagonally. When the water has boiled, add the noodles, stir once or twice, turn off the heat and let them steep until they’re not fully tender – 3-5 minutes. Put the oil in a large skillet over medium high heat. When the oil is hot, add the garlic and ginger to the skillet and saute until fragrant, 1-2 minutes. Add the chicken and cook, undisturbed, until the pieces brown and release easily, 2-3 minutes. Then cook, stirring occasionally until the meat is no longer pink, 2-3 minutes. When the noodles are done, drain well, reserving some of the soaking liquid and shaking off as much excess water as you can. Stir the curry powder and the agave syrup into the skillet with the chicken. Cook until the curry powder is fragrant, about a minute. Add in the soy sauce, fish sauce and the red peppers and stir to combine. Strip about 1/2 cup of basil leaves from the stems. When the peppers begin to soften and the chicken is cooked through, add the noodles and a splash of the soaking liquid, along with the scallions. Cook, tossing well with tongs, until the noodles are tender and most of the liquid evaporates. Taste and adjust seasoning, if needed. Stir in the basil and serve. I like to make a quick green soup using the boxed low sodium chicken broths. I’ll throw onions, carrots, celery, garlic, in the pot .simmer then add a big bunch of kale or other greens and seasonings, simmer some more and blend it all smooth with the handblender. Easy and healthy! Your noodles look super yummy BTW! My favorite quick recipe is your curry miso udon!! I have made it a million times with many variations. It’s so hearty, so satisfying, and flavourful! Love it. How is it that I finished lunch and you’re already making me salivate? My favourite fast recipe is to cook a whole chicken in my slow cooker. I use whatever spices I have (onion powder, garlic powder, smoked paprika, thyme, salt + pepper) and it’s in the slow cooker on top of onions and carrots for 5-6 hours. Easy, peasy and I’ve got a meal, plus leftovers. My favorite super quick comfort food dish is rice and beans! A tin of black (or other) beans a cup of rice a couple of crushed cloves of garlic and a chopped chili in a pot with one and one third cup of water bring to a boil cover and turn down to minimum heat. Serve with Caribbean hot sauce, avocado and any other veg or salad that you have lying around! If I’m going to saute potatoes with something I’ll microwave the pieces in a little bit of water for a minute or two before and it cuts like 10-15 minutes of cooking time out of the whole thing. My favourite quick tip is to freeze ginger and grate it on a microplane instead of chopping it. It’s so finely minced that it really distributes the flavour well, and it’s super easy to grate when frozen. My fast tip is heating up leftover pizza in a lidded skillet on low, instead if the oven. Faster and tastier! But my forever go-to fast meal is scrambled eggs! I like making frittatas using vegetables I’d chopped up (and/or microwaved) and saved in the freezer. Just thaw, mix with 8 eggs, some salt, and a small heap of grated parmesan, then cook on stove and finish under broiler. My fav veggie combo of late is swiss chard (chopped up and microwaved before being frozen) and caramelized onions (made in giant batches, then frozen in ice cube trays – I use about 3 cubes’ worth per frittata). 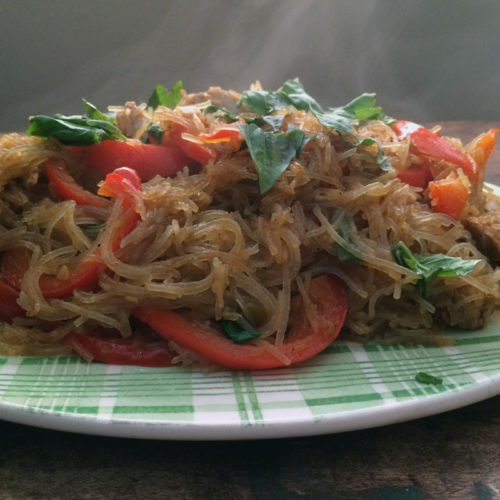 First, I love Singapore noodles. Second, my tip is when making soups, I often throw bones in to cook at the same time as the veggies instead of working with broth. Then I just fish them out when the soup is ready. Other than planning meals in advance, and trying have things chopped or pre-cooked, I can’t think of any great tips to offer. Clearly I need this book to help me out!! This is an awesome giveaway – thanks! I love making a dish with brown rice, chicken, whatever vegetables I have on hand, pear or quince, and some Moroccan spices into a quick and healthy dinner! My favourite fast and healthy recipe is a mixture of veggies I have in my bridge. I bring it to a boil (to create a fresh broth) and then I add some miso to give it taste. For texture, I like to add some fresh tofu noodles … I love soup noodles especially now in the winter time! That noodle dish sounds divine and it appears that it is gluten-free too. Yeah! My quick and easy meal is some kind of pita bread, some grated cheese, sauteed veggies, pop it into the oven for 5 minutes until cheese melts…sometimes I throw a fried egg on top and it’s done. Soft tacos are my go-to quick meal. 1 lb ground beef or turkey, browned, + 8 oz of tomato sauce + 1 tsp each of garlic powder and chili powder=great filling for tacos, burritos or quesadillas! I don’t have any special fast recipes but my best tips are to make huge batches of soup and have tons of containers in the freezer for fast easy meals. First of all, I love your blog! This is the only food blog that I follow since it is stuff I will actually cook and is interesting and creative without being uppity and schmancy. Second, I was going to share my quick pureed veggie soup but someone beat me to it. Instead, here is a quick, easy dessert that resulted in a marriage proposal last time I made it: Chop up an assortment of fresh fruit-oranges, pineapple, banana, strawberries, whatever-and place in a shallow baking dish and squeeze a lemon or lime over. In a small saucepan (or in the microwave I just realized), melt some butter, add enough brown sugar to soak up the butter plus some shredded coconut or flaked almonds or what have you, plus a pinch of salt. Glop the melted mixture on the fruit and broil in the oven briefly until browned. Serve over ice cream. Hot, cold, crunchy, tangy, creamy, a bit salty-it hits all the notes! Love to prep everything first before starting to cook. Making sure it is all ready ahead of time means you can get right down to it. I have bee making the same quick go to meal since University – make a quick peanut sate sauce, saute some veggies and tofu, and put on the quickest grain I can cook – couscous or quinoa. Dinner in about 20 minutes! Hmmmmm. I think that my quick tip involves some beforehand work. In the fall, I make many slow roasted roma tomatoes in the oven, freeze them and then all winter long, I throw the frozen tomatoes into sauces, soups, onto pizzas. Hi! My favourite quick-meal tip is to use a good quality pre-made crust, a little pesto, some veggies and a generous helping of cheese. Ten minutes in the oven a voila, a gourmet pizza! I do this at least once a week, and my 3 kiddos will often make their own creation. It’s fun and way too delicious. Mark Bittman is the best. My favorite quick dish is mus-sa-mun curry. Happy Holidays! My favourite fast meal is a peanut soba noodle stir fry – I use bagged broccoli to save time, thinly slice some red pepper, dice tofu, cilantro, green onion. As the noodles cook, I stir fry the veg and tofu and make the sauce (peanut butter, soya sauce, lime, sesame oil, thai chili sauce, rice wine vinegar). I could eat it every day! My go to quick meal is pasta with white clam sauce. You start by putting on a pot of water to cook the pasta and from there it’s about 15 minutes. I just saw this Bittman book at the library and would love to add it to my own. Thanks for hosting this great giveaway. My favorite fast recipe is soon tofu. You add the soft tofu to some sort of broth, bring to a boil, and you’ve got dinner. For variations, I drop in an egg, add seafood mix, or add frozen dumplings. I make and can my own soup stock so my quick meal is to make fridge soup using up little bit of leftovers. The book looks to be a wonderful prize. thanks for the chance. One of my favourite fast things to cook are perogies. Sometimes I’ll just boil them, pan fry to make them crispy, add some sautéed onions, salt and pepper, a dollop of sour cream and add a nice big salad on the side. A Perogie casserole is also delicious and quick. Layer perogies with ground chicken or turkey, assorted pan fried peppers, salsa and cheese and then bake in the oven at 350 for about 25 minutes or until cheese is golden and bubbly. at the moment my favourite ‘fast’ food is fried rice. I sauté up a bunch of garlic and green onions, add a bunch of veggies I like (usually kale, carrots, and something else crunchy from the fridge), add hot sauce, soya sauce and when veggies are cooked drop in and scramble an egg throughout. A quick lunch…especially when there is leftover rice. Love to cook brown rice then add any veggies or meat I have on hand. My go-to is mapo tofu – I use frozen chopped vegetables and grate the ginger and garlic to keep the prep minimal. I make rice in the rice cooker and I can get dinner done in under 30 minutes. 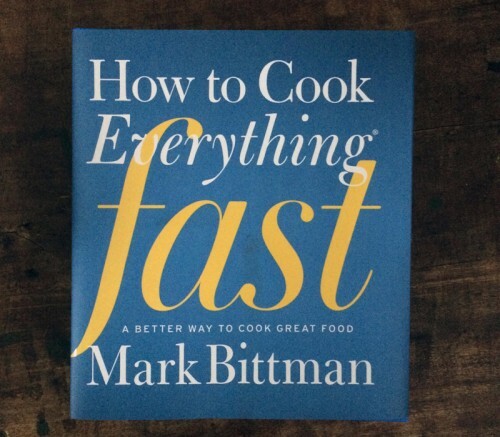 What a wonderful giveaway–all of Bittman’s books are really user friendly and packed with good ideas. Wishing you the best this holiday season. My favourite quick meal is veggie burritos. I probably make it once a week and it’s still one of my favourite meals! I use Amy’s chile refried beans (they’re my guilty pleasure!) but the key to the burritos is the simple guacamole, my mom’s recipe. Wishing you joy this holiday season! My favourite quick tip is to involve my daughters in the prep work! There are a few dishes I will only cook if they are around to help out. We share the chopping, or I make pizza dough while they chop toppings, or I chop veggies and cook noodles while they prepare the sauce or marinade. 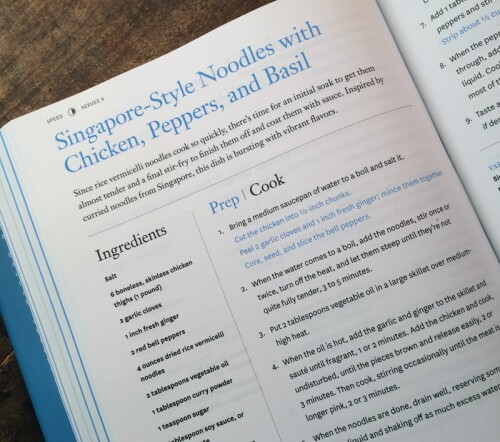 But when I’m cooking alone for the three of us, my quick recipes are a skillet pasta casserole that is especially quick because I freeze pre-cooked hamburger, or simply sautéed tomatoes and garlic mixed with pasta and fresh basil, or a rice and black beans skillet dish from Simply in Season. I’m with Bittman – I don’t prep everything ahead of time, just the things that are necessary to keep the entire process time efficient. i have a salmon recipe that broils the salmon and the veggies at the same time…done in 8 minutes! Eggs are my go-to quick recipe: scrambled, fried, omelet, etc. You can fancy them up with veggies or smoked salmon, or just keep it simple. Looks like a great cookbook! Homemade teriyaki bowls! Grilled chicken breasts, rice, quick homemade teriyaki sauce, and roasted or steamed vegetables – quick, easy, and delicious! Quick pasta made with soba noodles, kimchi, chopped greens and toasted sesame oil. I just made this dish and it was delicious! I’m amazed at how authentic it tasted. It’s gotta be the fish sauce. 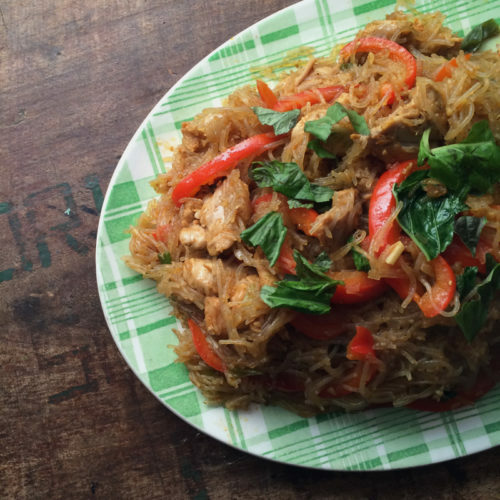 Fast, easy, yummy. Thanks! Susan, so glad you enjoyed this dish!! I know, surprisingly authentic!